Every month, the mayor and councillors of Bancroft, Ont. meet at Club 580, the town’s seniors club. The session was closed to the public, but the group called “Gnomes for Justice & Equality” wanted to come inside. It was cold, after all. And they had some thoughts to share with town council about its year-old water rate hike. The mayor said he caught a glimpse of scissor blades in the hands of a protester named Joyce Dale. He and five councillors fled the room of angry townspeople. They headed to an adjacent kitchen and locked the door, cutting off any hopes of dialogue. Dale, an Anishinaabe woman, said she was disgusted by the councillors’ reaction. Dale raised the scissors to her head. “So here, give it to them.” There were gasps as she snipped off her salt-and-pepper braid, throwing it onto one of the plastic tables. Bancroft is a rural municipality in eastern Ontario tucked in the northern tip of Hastings County. From downtown, it’s a 2.5-hour drive east to Ottawa; 30 minutes to the northwest gets you to the bottom edge of Algonquin Provincial Park. “It’s been tight,” said Carissa Card, a mother of three boys aged 6, 5, and 2. Ready-to-eat Jell-O and pudding packs were their favourite snacks — and the first items dropped off the grocery list. Card receives $1,600 monthly from the Canada Child Benefit that’s supposed to help with the costs of raising children. But she said roughly $250 of that goes to paying for water. She shares a copy of her water bill dated Dec. 27, 2018. It’s past due with $620 owing. “Once you get behind it can be very difficult to catch up,” said Wilma Brethour, a community activist who sits on the town’s finance committee as a citizen member along with three councillors. Mayor Paul Jenkins was in that heated meeting last winter — and in that locked kitchen with councillors. He said they fled the protesters for “safety” reasons. At that time, he had been in the job for just over a month, coming into the role after his predecessor resigned. Tourism drives the town’s economy, so it’s no surprise the municipality’s biggest industry is retail, which is responsible for 255 jobs, followed by construction, with 200 jobs, according to Statistics Canada. Nearly 3,900 people call the town home. But that changes in the summertime when the quiet countryside swells with at least 40,000 cottagers. They travel through the town’s three traffic lights to get groceries at the No Frills, buying bags of chips, burgers and maybe some corn if it’s in season. Identifying the cause for why people are leaving isn’t hard. Under this sleepy community, just follow the water and sewer pipes back to the Bancroft’s wastewater treatment plant. Constructed in 1974, and expanded in 2011, it was a costly and badly planned project that residents are now on the hook for. In 2003, one of the last pieces of legislation passed by Ontario’s Progressive Conservative government under Ernie Eves was the Nutrient Management Act. One of its provisions sought to ban the spreading of untreated septage — basically to keep human and animal waste from being pumped from septic tanks and sprayed onto farmland. The law was intended to prevent another Walkerton, where six people died after the Ontario town’s water supply was contaminated with E. coli. Almost half of Walkerton’s residents got sick during the outbreak. It was Canada’s worst public health disaster involving a contaminated water supply. In Walkerton’s aftermath, governments across Canada pursued new laws to prevent the spreading of septage near municipal wells to avoid E. coli contamination. Documents show neighbouring towns, including Hastings Highlands and the Village of Limerick, signed declarations that part of their tax revenue would support the operational costs of Bancroft’s expanded plant. The more users on the system, the lower the costs for everyone. In 2005, the Canada-Ontario Municipal Rural Infrastructure Fund awarded Bancroft $6.4 million for the expansion project. Designers and engineers were hired to draft plans to increase the plant’s wastewater treatment capacity to handle 10,000 septic tanks. By then, the Ontario Liberals led by Premier Dalton McGuinty were two years into their mandate. Unexpectedly, the part of the Nutrient Management Act that mandated septage treatment was scrapped. It created a domino effect. Neighbouring municipalities saw no more reason to send their septage away for treatment. But costly upgrades were still needed for Bancroft’s plant to meet new provincial guidelines. Danny Palmer and his 13-year-old son use egg timers when they shower. Seven minutes each. It’s one of several methods the widower has come up with to save cash since his water and sewer bill tripled two years ago. Under current rates, his annual bill is over $3,000. The former miner and labourer homeschools his teenage son, who has special needs. Palmer pays for educational supplies himself. This year’s curriculum cost $600. Palmer, 52, also receives disability payments now. For the past seven years, he’s been getting treatment for cancer. The father of seven doesn’t work much anymore as his body goes through rounds of chemotherapy and radiation. Money has been stretched since his wife’s sudden death in 2017. Palmer tells a joke, but there’s sadness in his voice. He says he should have been the one to go. The long-term math isn’t promising. His monthly $1,300 disability cheque can’t cover everything including the mortgage payment, taxes, food, “astronomical” hydro bills, or medicines not fully covered by the Ontario Health Insurance Plan or the Ontario Disability Support Program. High water and wastewater bills have also hit the town’s elderly, who make up nearly a third of the population, particularly hard. “They have to choose whether they’re going to buy their medications to keep them alive, or food to put on their table, or pay for electricity and water,” Palmer said. Something has to give for those on fixed incomes, and Palmer decided a while back that it would be the water and sewer bill. He hasn’t paid it in about a year and a half and estimates he’s about $5,000 in arrears. He’s upset town council isn’t showing much empathy. He searches to understand where fairness comes in. “They know that 80 per cent of the population is elderly and low-income. And because we’re the ones inside the town, the ones that are on the rolls for taxes and water, we’re the ones being penalized for it,” he said. They have to choose whether they’re going to buy their medications to keep them alive, or food to put on their table, or pay for electricity and water. Come May, it will be two years that Palmer’s bills are in arrears. He’s rushing to repair the family home so he can hopefully sell it before the town takes it. He figures he could walk away with $80,000 after the sale and move with his son to Thunder Bay, where he’s scouted a property that boasts $380 in annual taxes. His current home used to be his grandparents’ old farmhouse. Palmer explains he’s the only sentimental soul in the family who wants to hold onto it. Palmer’s mother now lives 17 kilometres west in Cardiff, Ont., where her annual water and sewer bill is $1,100. Palmer is billed three times that in Bancroft. It’s against the law for municipalities in Ontario to carry deficits for operational costs. The Town of Bancroft was forced to take out two long-term bank loans. But that isn’t happening at all. Recent census data suggests growth is stagnant: the town’s population in 2011 was 3,880 and went up by one in 2016. There are 533 municipal wastewater systems across Ontario. They serve large metropolitan areas as well as rural towns; they range in size, condition, and operational costs. Wastewater produced by Toronto’s 2.7 million residents is treated by four plants. Others service smaller populations, such as 313 people in the northern community of Latchford. With the province’s towns shrinking, and aging water-related infrastructure needing repair or replacement, small municipalities are feeling the financial pinch of maintenance costs. Bancroft makes no revenue from its expanded wastewater plant. It’s been a drain on municipal finances since 2011. The town was paying the Ontario Clear Water Agency, a third-party operator that managed the plant until 2017, approximately $500,000 more than what it collected from sewer bills, according to Bancroft This Week. Veolia Water Canada, Inc. currently operates the plant. And there are operational issues. More money down the literal drain. Bancroft This Week reported the town has a seven-figure debt exacerbated by problems related to the treatment plant. Users have reportedly been overcharged because of rainwater and run-off seeping into sewer lines. Around 40 per cent of the treated water is lost before it reaches the town’s taps through leaching. But there’s no money to replace pipes. The government raised flags years ago about the mass delay in critical maintenance for the province’s water systems. 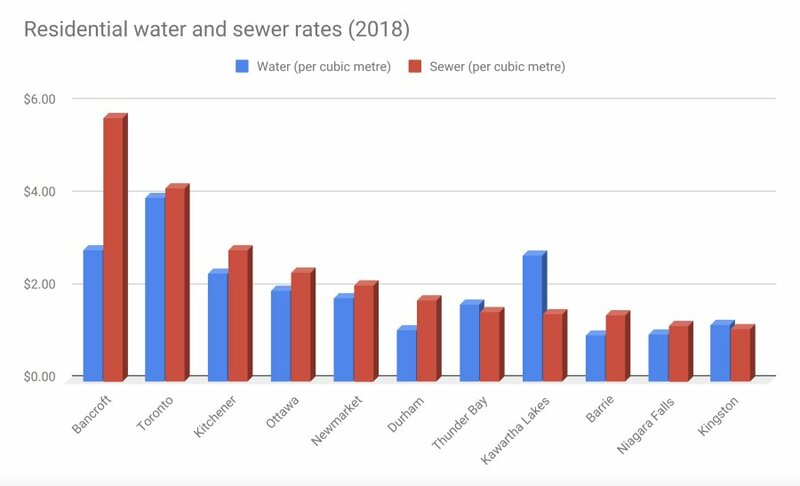 In 2005, Ontario published its Watertight report noting that $11 billion in necessary repairs posed a “serious and growing problem” for municipalities. It said $30 billion to $40 billion would be needed over the next 15 years to update water and wastewater infrastructure. Seven per cent of the town’s tax revenue is used to cover the plant’s operational expenses. Rates shot up in 2017, despite the fact plant expansion wrapped in 2011. Some residents say town council took too long to mitigate the issue; others think it isn’t aggressive enough in demanding provincial assistance. “In 2015, our wastewater rates were $2.61. In 2018 they jumped to $5.69. It’s unreasonable,” Reynolds said. The activist works with North Hastings Community Trust, an advocacy agency focused on poverty and social justice issues. Hairdresser Tammy Lynn Vardy’s business uses a lot of water and the increases have added significantly to her overhead. Her water bill for January-February 2016 was $313. That jumped to $952 for the exact same billing cycle in 2018. A report written last year by the town’s former chief administrative officer Hazel Lambe asked the Ontario government to pay for the financial mess it created. Queen’s Park has yet to acknowledge its role in Bancroft’s financial troubles. Because plant upgrades ended in 2011, the town isn’t eligible for current provincial infrastructure funding to help pay for completed water and wastewater projects. “The town could submit an application for a new project,” Sousa-Dias said. Bancroft officials say their plan now is to focus on courting more residential and commercial developers — more users on the system. But with the current water and sewer rates unchanged, it’s been a hard sell. Walmart had considered opening a store in Bancroft store, but backed out after deciding it wasn’t an economically feasible choice. Bancroft’s water and sewer rate hike has illuminated another issue: a lack of affordable housing. Before Palmer settled on the idea to move to Thunder Bay, he searched his hometown for alternative housing. But the options were slim, let alone in his price range. And if he found something, chances were the expensive water and sewer bill would follow him. “Only people coming up from the cities can afford to live here,” he said. There was no point getting into one of Bancroft’s 60 low-income housing units, which are subject to the same high rates. His son isn’t happy about the idea of uprooting, but he understands his dad is choosing to make the hard decision to leave. Palmer said he was initially very angry and bitter about the situation. He’s now focusing on selling the house before the town can seize it. The widower shares more about the northern property he’s planning to buy if he can sell this one. He calculates land and house construction would cost $94,000. It’s a non-organized township so no building permits are required. They can build whatever they please. “It’s your property, nobody’s ever going to come in and move you out of there,” he said. He drops details of the future he’s been envisaging. The house will be off-grid and self-sustaining, set on 160 acres, their 160 acres, with timber and mineral rights — and access to their own freshwater supply. There’s no talk of water and sewer bills.